Garage Workshop Workbench. Heavy & Medium Duty Workbenches. SupeRack workbench is custom manufactured in heavy duty or medium duty using steel pallet racking and long span complementary. Both economical, versatile and rugged, our heavy duty and medium duty workbenches are ideal for the handyman or for a wide variety of industrial uses such as packing or assembly of goods. The workbenches come with 25MM/18MM particle board tops as standard but can be customized to have plywood, MDF, HDF, steel or stone tops. Standard shelf level below the tops to hold tools, packing material and accessories is provided. Additional levels can be added to suit. A wide range of accessories can be fitted as per requirements. We can make custom made workbenches to suite your design, size and requirement. They can be made to fit additional shelving, louvered panels, electrical connections etc. 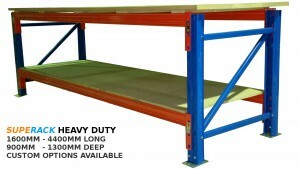 Our workbenches are made from heavy duty pallet racking or heavy duty londspan shelving. They are sturdy and can take on the extensive and heavy duty use in your workshop or assembly line. 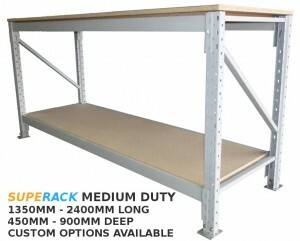 SuperRack heavy duty workbenches are made from 1.8mm steel and can bear loads between 4600 KG to 1600KG. Medium Duty Workbenches are made from 1.5mm steel and can bear loads between 720KG to 440KG. If you are looking for a versatile workbench which lasts a lifetime, this is for you. 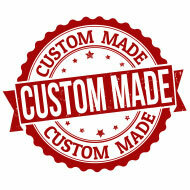 We can ship our workbenches Australia wide.